Attorney General Loretta Lynch was caught red handed discussing grandkids with Bill Clinton. Bill’s wife, Hillary, was under investigation at the time for her secret email server. So the AG turned over her decision making authority in the caper to FBI Director James Comey. When Comey decided not to prosecute, a Greek Chorus of Democrats sang his praises. But when he reopened the case, due to emails found on Carlos Danger’s laptop, they changed their tune. 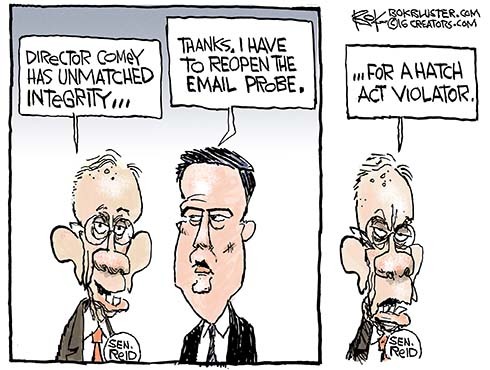 Harry Reid, having pronounced Comey’s integrity beyond question, questioned it by accusing him of violating the Hatch Act. At least he hasn’t accused Comey of not paying his taxes. Yet.